Digital Engagement — NexJ Systems Inc.
Technology has forever changed the way buyers research, select, and interact with vendors. Digital consumers are researching vendors, advisors, services, and products and making decisions before they begin engaging with a firm. When it comes time to make a purchase, 81% of digital buyers choose to engage with vendors with a strong professional brand. NexJ builds a unique interest graph for each client or user that reflects all the information the firm has, including demographic data, transactions and holdings, interests, and area of expertise. 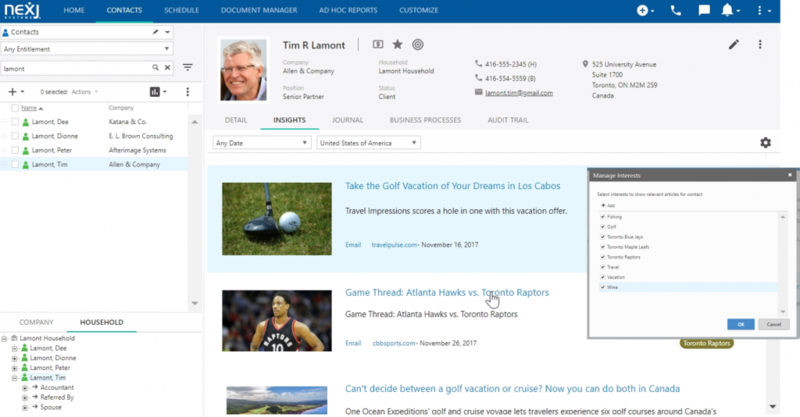 A sophisticated Artificial Intelligence engine matches documents to user and client profiles to deliver content uniquely tailored to each recipient. Digital engagement documents include internal documents, such as research and training documents; publicly available content, including news articles and press releases from more than 10,000 publishers; and client-purchased content. All content is filtered through an AI compliance engine to ensure the document, and any accompanying commentary from the employee, complies with financial and fiduciary regulations. Approved digital engagement content is then made available to the appropriate individual(s), channel(s), or the CRM software. Click here to download our brochure with more details about NexJ Insights, and Grapevine6.